This retractable eyeliner pencil creates precise lines, sharp colors, and smokey eyes! The long-lasting, water resistant formula delivers powerful, vibrant color that lines your eyes in a statement! Plus, Naomi comes with a smudge tip and built-in sharpener. Uncap and draw across the lashline. If desired, work quickly with the smudging brush to smudge the line for an instant smokey eye. Close the cap tightly to preserve freshness. What is naomi’s glambam eyeLiner? A mechanical pencil liner that sharpens or smudges perfectly to help you achieve whatever look you’re after! What colors does naomi’s glambam eyeLiner come in? How does the naomi’s glambam eyeLiner work? Whether you apply it thick or thin, this liner goes on smooth and stays blendable for 20 seconds until it sets in place and to give you a long lasting line that won’t budge. WHAT INGREDIENTS ARE IN naomi’s glambam eyeLiner? WHAT IS naomi’s NET WEIGHT? TELL ME WHAT MAKES naomi’s glambam eyeLiner SO AMAZING? WHAT ARE THE BENEFITS OF naomi’s glambam eyeLiner? How much does naomi’s glambam eyeLiner cost? Where can I purchase Naomi’s GlamBam Eyeliner? Is Naomi’s GlamBam Eyeliner PV eligible? Yes. Naomi’s Glambam Eyeliner is PV eligible. Can you add Naomi’s GlamBam Eyeliner to your Loyalty Box? Yes. 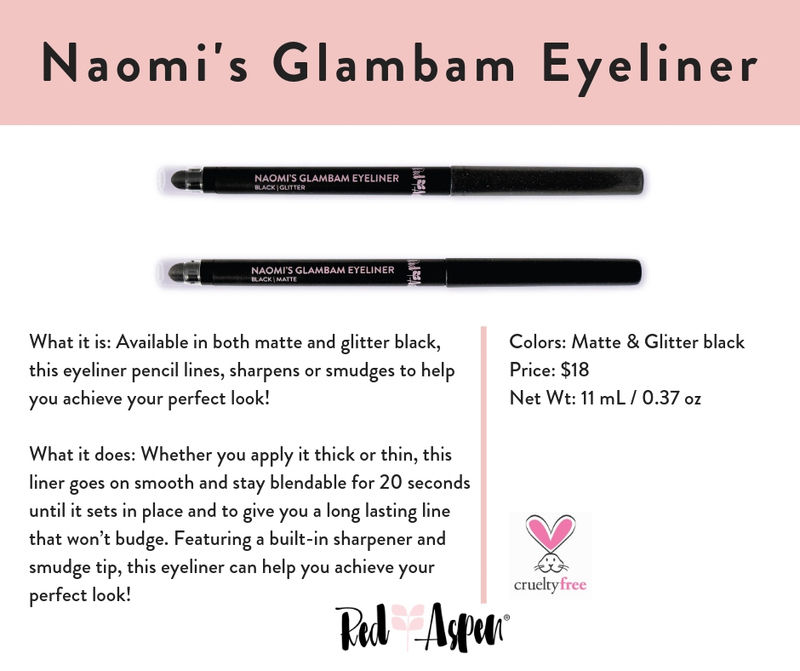 Naomi’s Glambam Eyeliner is available for both customers and Brand Ambassadors to add to their Loyalty Box.